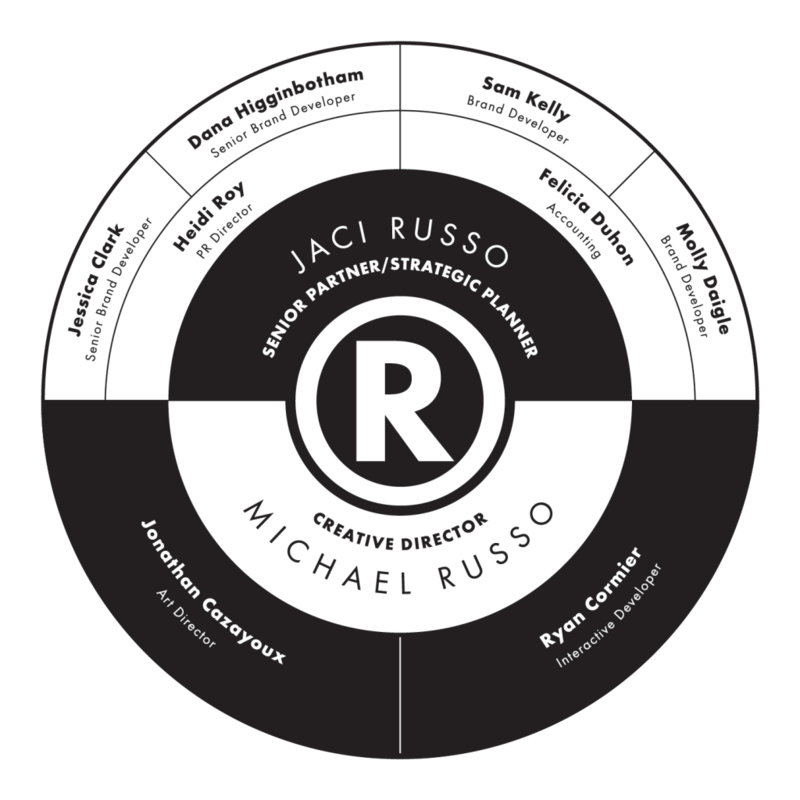 RUSSO was launched in February of 2001 by CEO Jaci Russo and Chief Creative Officer Michael Russo. Since then, RUSSO has grown to include a diversified client roster including experience with a wide variety of industries and geographies. Our branding process, Razor Branding™, permeates all levels of advertising, marketing, interactive, social media and media management – giving us a unique advantage in first identifying our clients audience, then developing messaging, strategies and creative that builds consumer loyalty and brand advocacy. Our team structure is unlike most agencies because our departments serve and benefit one another. Here, we believe in the dynamic of branding being equal parts creative and strategy. So we structured our company to play to the strengths of that duality. Our philosophy is directly related to our process, which we call Razor Branding™. Razor Branding develops brands from the inside out, establishing a series of branded touchpoints that form emotional connections with the consumer. Developing these connections relies heavily on understanding the psychographics of consumer behavior, and not just demographic profiles that rarely tell the whole story. Understanding perceptions, attitudes, beliefs, and the lifestyles of our clients’ consumers better position us to develop messaging that motivates individuals and best meets their needs – regardless of industry, size, location, or category. Razor Branding™ works towards three primary goals at all times: Focus, Connection, and Harmony. Focus defines that one differentiating and powerfully compelling quality that makes brands razor sharp. Connection establishes the “voice” or message of the brand, making it the preferred choice over the competition. Harmony works to identify and then develop a series of branded touchpoints that establish trust between a brand and the consumer. Whether the Razor Branding™ process is carried from start to finish, or simply used in principle as a foundation for a project, this approach to thinking about the consumer and their brand choices, helps our team craft strategies and messages that motivate consumer behavior. With the public more savvy and better armed with information today, we understand that it takes more than just a pretty picture and shelves full of awards to win the day. For us, creative without strategy is just art. At RUSSO, the desired outcome for all marketing and advertising initiatives is to produce advocacy for your brand – and the only way an agency can do that is to lead creative with insights and strategy in a way that produces substantially different results. By changing the conversation, we are able to clearly define the promise behind the brand, within any given category. In doing so, consumers can easily understand how a particular product or service can enhance their lives. No matter how creative the advertising, a poorly positioned product, service, or brand will fail sooner or later. For this reason, we work with the client in developing what is most worthwhile to communicate to the consumer – giving them a reason to join their tribe. What “mental real estate” is yours to own? What differences may you authentically claim? Why should we (the public) care? The following elements provide a proven system that assess where you are, where you want to be, and what it will take to get you there. They also provide the framework and architecture for implementation. The following are a few of the elements that make up our process – depending on which package works for your needs.